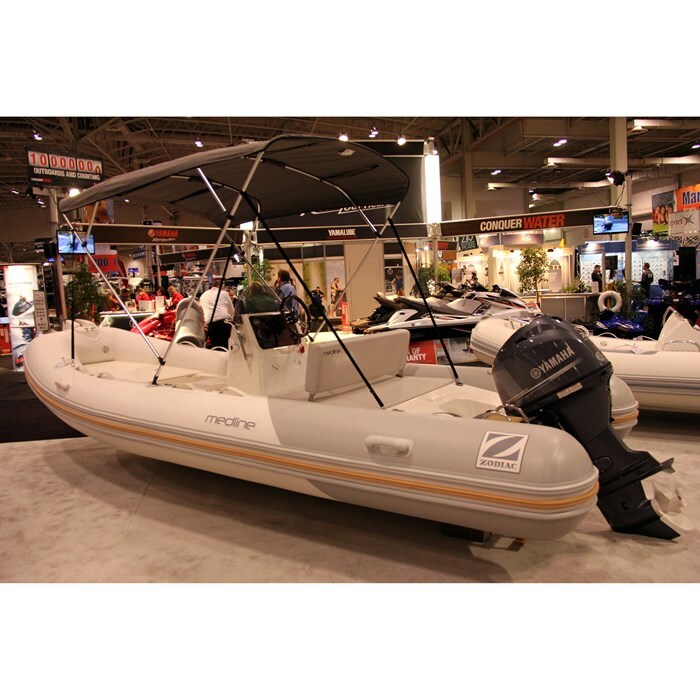 The new Medline series from Zodiac® Marine of the United Kingdom comprises three models: the 500 at 16’5”, the 540 subject of this review at 17’9”, and the 580 at 19’0” length overall. The fourth Medline model, the 850 at 27’11” is considerably larger and not a new model this year. The four Medline models are part of Zodiac's® eight model Comfort Cruising series, the other four being N-Zo models. These eight Comfort Cruising series models are part of over thirty “boat” models in four series (the other three series being Sport Cruising, Easy Cruising, and Yachting) plus over thirty models in the Tender series offered by Zodiac® for 2014. Zodiac® of course is also famous for the many life rafts it produces. The three new Medline models each have a new hull, a new deck, and new tube and have been “completely redesigned to deliver outstanding comfort, ride quality, performance, and fun in the sun!” The Medline 540 is the mid-size of these three new models and therefore very representative of the three, and at almost eighteen feet LOA, a very desirable length for its intended use as an all-round family cruising, exploring, watersports, and transportation vessel. All three of the new models are fairly similar in layout and feature a starboard side helm console with smoked windscreen, side-mounted motor control, a varnished wood rim steering wheel, and a stainless steel grab rail mounted on the left side of this console next to the portside walkway leading to the bow seating area. The layout and even square footage from the console forward (aside from interior beam) is very similar on all three models. Immediately in front of the console is a forward facing bench seat with padded backrest and which seats one adult very comfortably, or possibly two very snugly. The optionally padded bow section is a great sunlounge or doubles as a rear-facing seat for two to share the optional, removable bow table. All three come with a stainless steel bowsprit with roller and integrated mooring cleat for easy anchoring. The size, area, configuration, and features of the sundeck behind the driver’s console constitute the major difference among the three new Medline models. 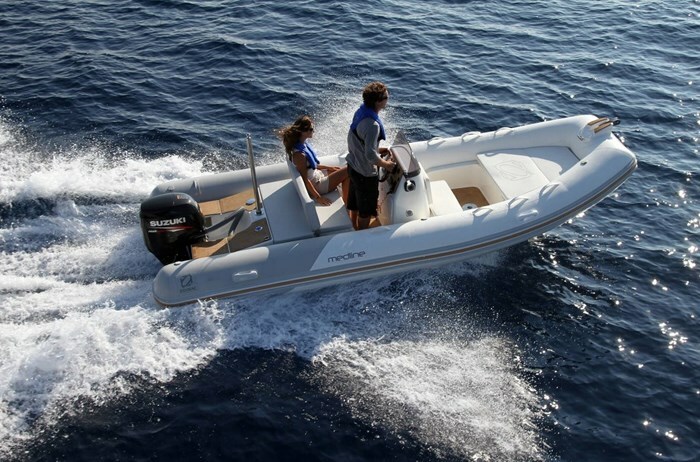 On the 540, the full-width backrest of the two or even three-person wide helm bench seat folds to form a large and flat rear sunlounge leaving both port and starboard swim access platforms on each side of the motor. A folding swim ladder on the port side of the transom is standard. An optional waterski pole centre mounts immediately behind this folded down sunlounge and ahead of the motor well. 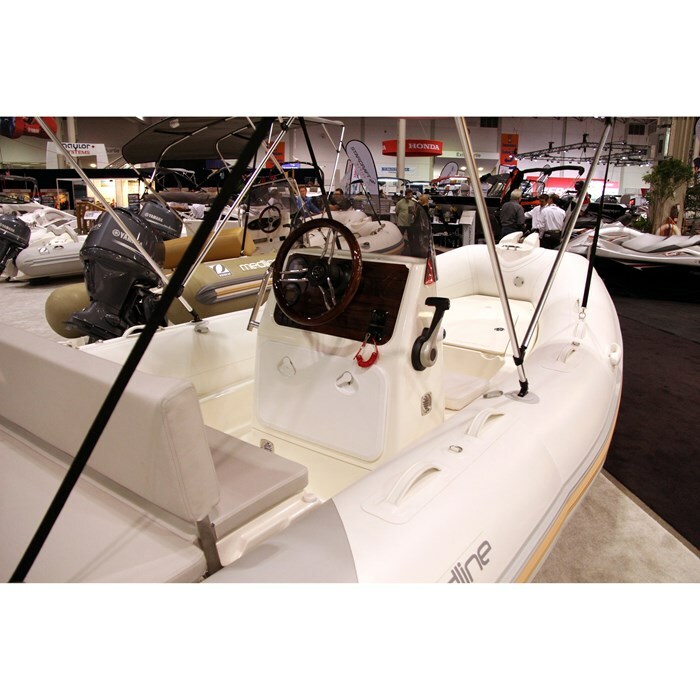 Sealed storage areas are provided within a bow locker and under the helm seat. The Medline 540 hull is a very deep-V 25° deadrise of polyester construction with a non-skid, self-draining cockpit. This cockpit (and the helm console instrument panel) may be optionally covered with synthetic teak if so desired. The buoyancy tube of 1’8” diameter is removable “banana” shape with “Easy Push” valves and constructed of Strongan™ Duotex™ or Hypalon™-Neoprene™ fabric with five airtight compartments. Overall beam of the Medline 540 is 7’6” with an interior width of 4’1”. 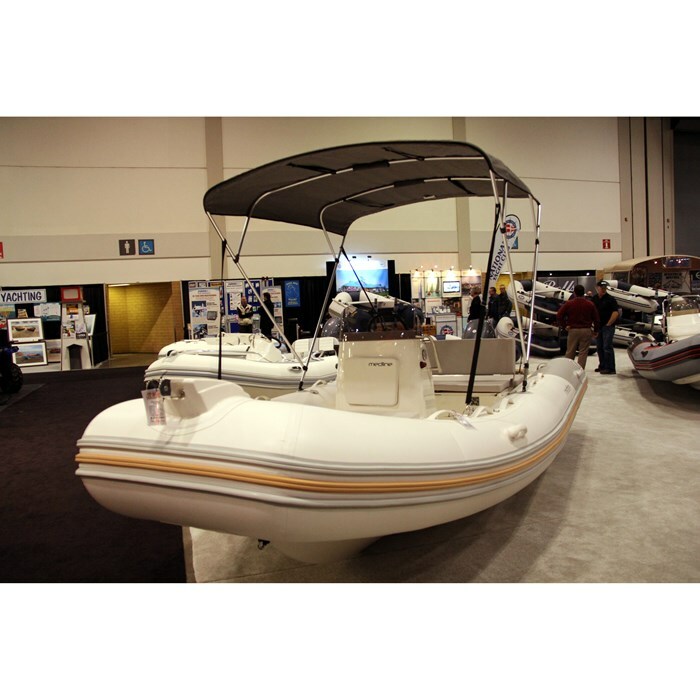 Notable factory available options for the Medline 540 include an electric bilge pump, GPS/depth sounder, compass, 12 VDC socket, audio system, arch/roll bar, shower kit with freshwater tank, bimini top, and a mooring cover and/or console cover. Maximum allowable horsepower is 100 with a minimum recommendation of 60.